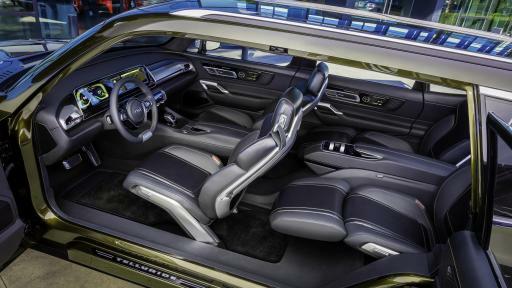 Glimpsing a future that is grounded in reality but not bound by the present, Kia Motors America (KMA) today unveiled a cutting-edge vision for a full-size SUV at the North American International Auto Show (NAIAS). 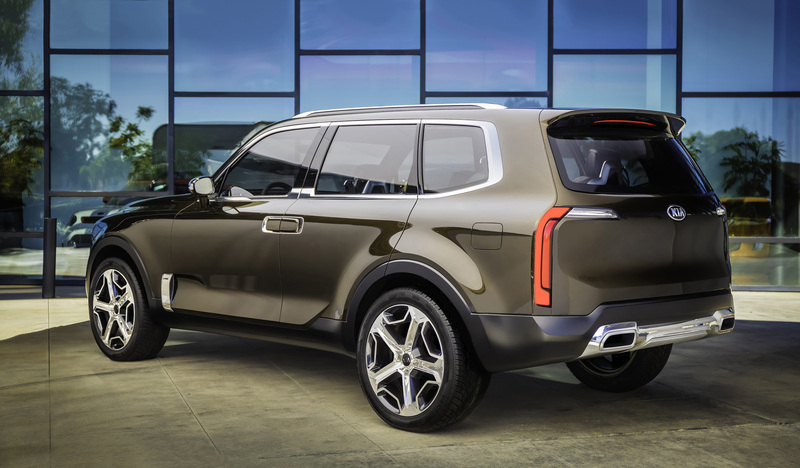 The Telluride, a striking three-row, seven-passenger, luxury SUV concept features a modern and upright shape, muscular stance, and state-of-the-art technology to care for its occupants. Purely conceptual, the Kia Telluride is based on an existing platform and reveals the brand’s interest in potentially offering a premium SUV positioned above the current hot-selling Sorento. 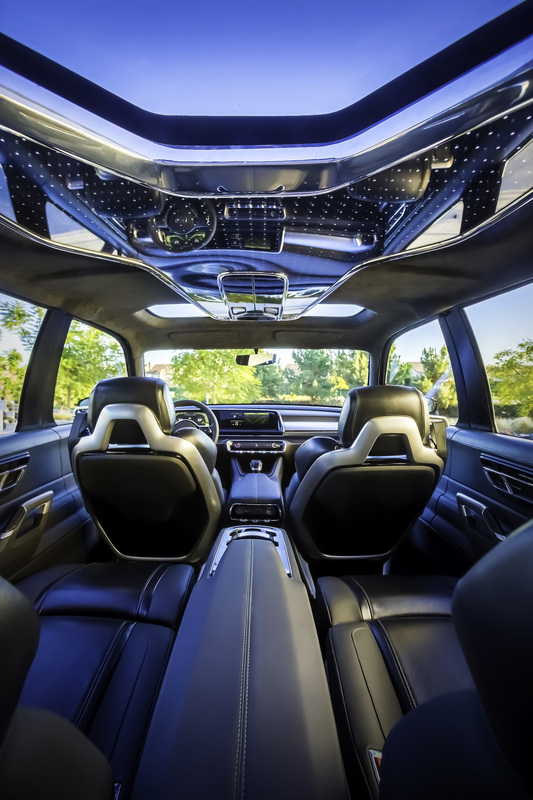 Telluride’s front doors and rear-hinged back doors swing open 90 degrees in opposing directions, creating an expansive and inviting portal into the panoramic interior space and revealing a technological showcase. Four beautiful black-leather captain’s seats appear to float within the spacious cabin in front of a folded third-row bench. The large cabin allows the middle seats to recline nearly flat and include large fold-away footrests for sublime comfort. All four seats include a series of precise diamond-cut openings in the seatback, each embedded with Smart Sensors to capture a passenger’s vital health information. Once obtained, these vitals are displayed on the interior door panel screens, which then systematically synchronize with a Light Emitted Rejuvenation (LER) system. The LER system utilizes a massive, wing-shaped LED panel mounted beneath the oversized sunroof that displays a pattern of therapeutic light to treat desynchronosis (jetlag) and improve the passengers’ energy levels. Another unique technology introduced in Telluride is Swipe Command – a thin, touch-sensitive, interactive band mounted to the second row center console – which allows rear-seat passengers to quickly scroll and select desired media by simply swiping their hand. The selected media is then played either through the seven-speaker premium Harman Kardon® audio system, or via a set of portable Harman Kardon® headphones that wirelessly charge when stowed in the console. 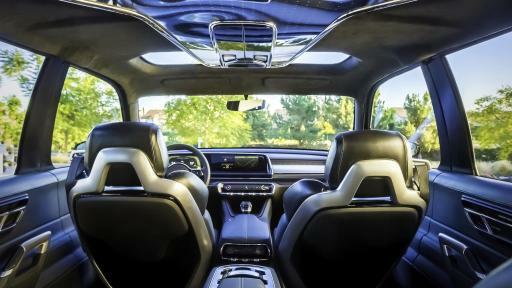 Up front, a compartment in the center stack allows for wireless cell phone charging, and Kia’s first use of 3D-printed components add a distinct, modern design element to the dashboard, door panels, and steering wheel. 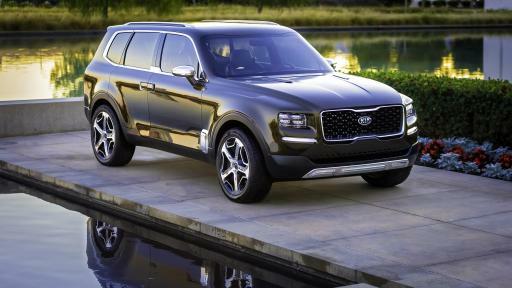 Telluride’s interior and exterior were penned at the brand’s California-based studio, Kia Design Center America (KDCA). Finished in Dark Pyrite green paint, the tall stance is amplified by the overall size of the vehicle. 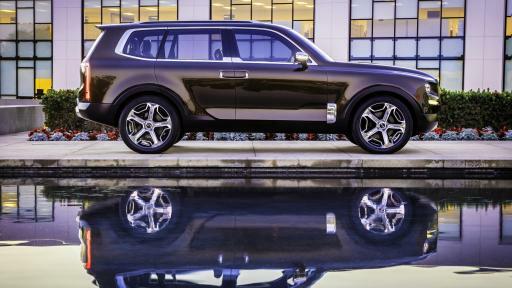 At 70.9-inches tall, 79.1-inches wide and 196.9-inches long, Telluride is 4.4-inches taller, 4.7-inches wider, and a sizable 9.5-inches longer than the current Sorento. 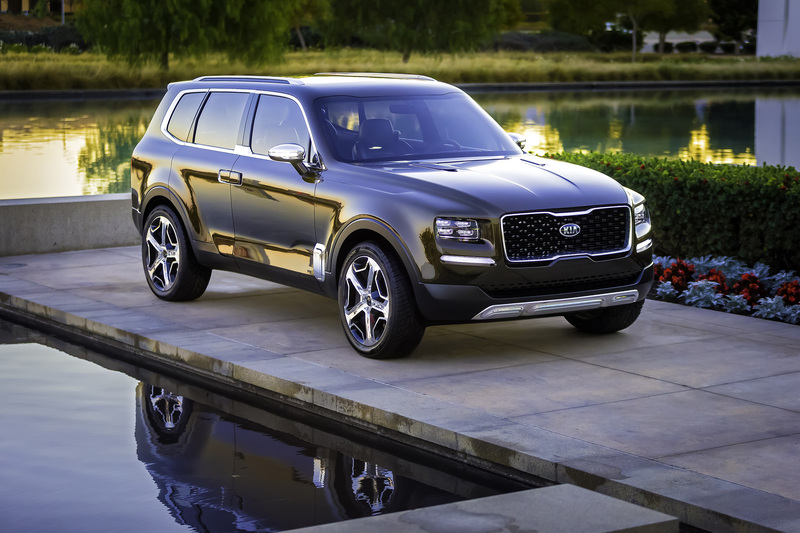 Underpinning the Telluride is a modified Sorento chassis with a wheelbase stretched 11.9 inches to 121.3 inches, giving Telluride a dominating presence. It’s modern and muscular appearance is accentuated by flared fenders stretching around massive 22-inch five-spoke wheels wrapped in Hankook® Ventus ST 275/45R22 tires. Telluride’s front fascia incorporates a much larger version of Kia’s signature tiger nose grille, and its menacing face brings an attitude all its own with recessed quad-LED headlamps, pronounced horizontal LED indicator lights, and an aggressive polished-metal skid plate below the bumper. In the rear, thin vertical taillights align with the modern design language of the SUV, while consistent styling cues across the front and rear door handles, hood scoops and dual exhaust tips enhance the vehicle’s solid appearance. With an innovative combination of cutting-edge technologies, the Telluride’s powertrain is a near-future, no-compromises propulsion system, offering both power and efficiency. A finger-print activated push-button start unleashes Telluride’s tremendously potent yet extremely efficient PHEV powertrain. Utilizing a 3.5-liter gasoline direct injected (GDI) V6 engine and powerful electric motor, Telluride’s transverse-mounted powertrain combines to produce 400 horsepower (270 horsepower from V6 and 130 horsepower from the electric motor) while achieving more than 30 mpg on the highway. Power is routed to all four wheels via an advanced all-wheel drive system. 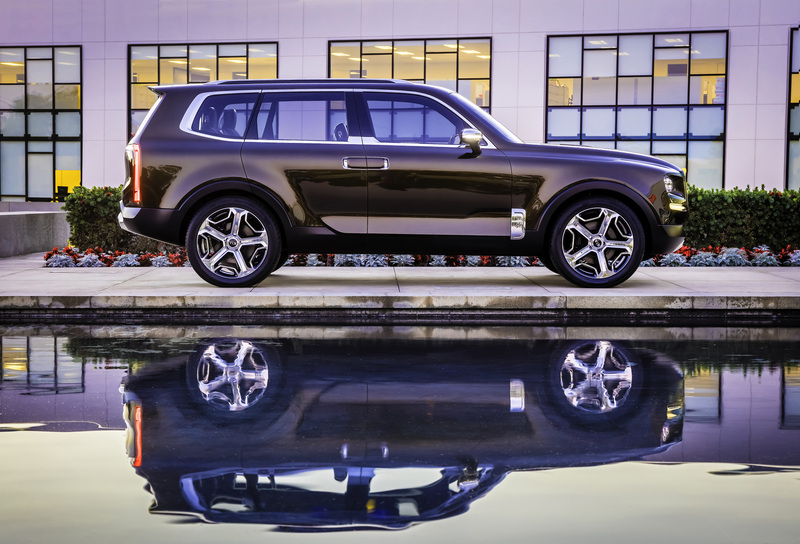 While there are currently no plans to bring the Telluride to production, Kia has a history of delivering production vehicles that bear strong resemblance to preceding concepts, and Kia’s large SUV is anything but a utopian fantasy. Kia Motors America (KMA) is the marketing and distribution arm of Kia Motors Corporation based in Seoul, South Korea. KMA proudly serves as the "Official Automotive Partner" of the NBA and LPGA and set an all-time annual sales record in 2015, surpassing the 600,000 unit mark for the first time in company history. KMA offers a complete line of vehicles, including the rear-drive K9001 flagship sedan, Cadenza premium sedan, Sorento CUV, Soul urban passenger vehicle, Soul Electric Vehicle2, Sportage compact CUV, Optima midsize sedan, Optima Hybrid, the Forte compact sedan, Forte5 and Forte Koup, Rio and Rio 5-door subcompacts and the Sedona midsize multi-purpose vehicle, through a network of more than 765 dealers across the United States. Kia’s U.S. manufacturing plant in West Point, Georgia, builds the Optima* and Sorento* and is responsible for the creation of more than 15,000 plant and supplier jobs. Information about KMA and its full vehicle line-up is available at www.kia.com. For media information, including photography, visit www.kiamedia.com. To receive custom email notifications for press releases the moment they are published, subscribe at www.kiamedia.com/us/en/newsalert. * The Sorento and Optima GDI (EX, SX & Limited and certain LX Trims only) are assembled in the United States from U.S. and globally sourced parts. 1 K900 available in select trims and in select markets with limited availability. 2 Soul EV in select markets with limited availability.